"The label began in 1989 when Chris Lombardi dragged the Austrian duo H.P. Zinker into Wharton Tiersâ Fun City studio to record OLE-001, ...and there was light. Run out of Chrisâ New York apartment, Lombardi added artists such as the Dustdevils, Railroad Jerk and Superchunk to the initial roster. Joined by longtime Homestead Records manager Gerard Cosloy in 1990, Matador experienced its first taste of crazed media attention & big sales with the North American release of Teenage Fanclubâs debut long-player, A Catholic Education. Over the years, the label has moved from shoebox sized offices to larger and larger complexes, the staff has grown from 2 to 24, and the roster has simply exploded. As well as functioning as the North American home to Pavement, Liz Phair and The Jon Spencer Blues Explosion, Matador has helped artists such as Yo La Tengo, Cat Power, Cornelius, Solex, Pizzicato Five, Helium and the Arsonists reach audiences worldwide. While Matador has often been characterized (not by the label itself) as an underground or âindieâ rock label, over the years, the labelâs musical direction has grown, to the point where many hip hop, electronic and experimental acts play as prominent a role in the labelâs sound & future as any number of singer/songwriters and rock bands. Sometimes all of the above converge. 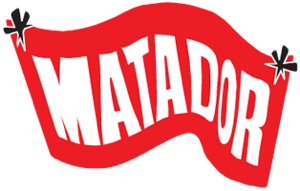 Throughout the labelâs history, Matador has been a champion of artistic freedom, diversity and innovation. The labelâs catalog and release schedule reflect the tastes of the companyâs owners, Lombardi and Cosloy, and their longstanding commitment to sharing the music they love with as many others as possible."